Amazing Nomads Podcast: Ed Cavanough - One Road to London. Ed Cavanough traveled 14291 thousand miles from Australia to London, taking 242 days, through 36 countries, 28 currencies, 26 languages, 83 buses, 23 shared cars, 14 trains and 7 ferries. Ed Cavanough left Adelaide in South Australia early in 2019 in his '99 Magna driving north, then selling his rust bucket in Darwin before traveling overland to London in the UK. 00:39 What happened after he sold his '99 Magna? Ed Cavanough is an Amazing Nomad, traveling 14291 thousand miles from Australia to London in 242 days, through 36 countries, 28 currencies, 26 languages, 83 buses, 23 shared cars, 14 trains and 7 ferries, making connections with people whose family and friends would serve as life lines. His journey is documented in his blog One Road to London. Julia & Nina, local villagers from Tajikistan. 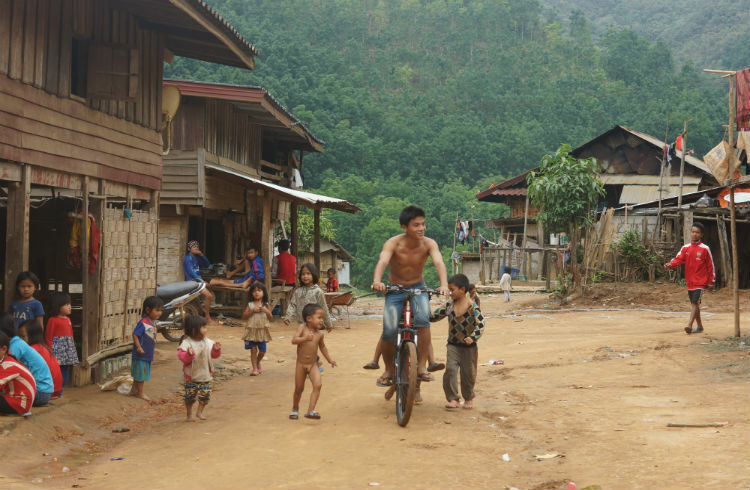 Laos villagers riding my bike. Speaker 1: The Wold Nomads Podcast bonus episode. Hear amazing nomads sharing their knowledge, stories and experience of world travel. Speaker 2: Welcome to this episode, featuring our amazing nomads. This time we feature Australian, Ed Kavanagh. Speaker 3: Ed traveled 23 and a half thousand kilometers overland from Adelaide in Australia, to London in the UK, making connections with people whose family and friends would serve as life lines and he was constantly surprised that no matter where he was in the world, help was always on offer. Speaker 2: Yeah. Ed left Adelaide earlier this year in his '99 Magna, drove north, selling his rust bucket in Darwin, and then what Ed? Ed Kavanagh: Well yeah, the intention was certainly to leave the Magna behind, and then just keep going all the way to London. There was this trip I wanted to do, really since I was a little kid, which was to go all the way from my hometown of Adelaide to London, basically the opposite end of the earth, through as much of the world as I could, and obviously overlanding is the best way to do that, and where possible, I avoided the planes, and decided to, once I was in East Timor, island hop throughout the Indonesian Archipelago as much as I could, and then once I got into Singapore it was basically overland all the way from there. Speaker 2: So you walked across Singapore? Ed Kavanagh: I did walk across Singapore. There's not too many countries in the world you can walk across, Singapore being one of the very few. I was also really frustrated with myself at the time because I'd endeavored to catch no planes after going to East Timor and very frustratingly ran of time on my visa, and basically got booted out and had to jump on a plane to Singapore. So I was really ruing my mistake, and almost sort of punished myself by committing to my overland ideals and decided to walk across an entire country. Speaker 3: So, that would've taken half an hour than. Ed Kavanagh: Well it was a beautiful day time stroll. It only took about eight hours, and to be honest I've never been a big fan of Singapore. I don't dislike it, but it's just a bit too familiar to home, and it was a pretty interesting way of seeing that island. There are some parts in the north that are very different to what you see in the south of that island, and it was actually kind of opened my eyes to that country a little bit more. Speaker 2: Well you've got some stats here. 23 and a half thousand kilometers, 242 days, 36 countries, 28 currencies, 26 languages, 83 buses, 23 shared cars, 14 trains and 7 ferries before you got to London. You've got to have a few stories to share along the way? Ed Kavanagh: Look for sure, and I must say, when I set out, I wanted to catalog it in some intimate detail, and I thought that'd be really fun, coming towards the end and having this sort of laundry list of statistics and data about this sort of trip. In the end it got really silly kind of collating that and looking at it through this statistical lens. It kind of became irrelevant really in the context of the broader things I was getting out of it. I mean, there are many, many stories to tell. Really, it's difficult to know where to start, but broadly speaking, what surprised me about traveling in this fashion is how straight forward it really is. It can look like this absolutely daunting prospect, but really, linking A to B the whole way through is a pretty straight forward process, and there's just endless accounts of people wanting to give you a helping hand along each way. You don't know before you set off how you're going to do this. It's an entirely improvised endeavor, and really the whole time I kind of relied on the assistance of local people to put me in the right direction, and that method really guided me across the entire planet. Speaker 3: Give us an example, I mean, what way did people help you? Ed Kavanagh: Well, a good example happened immediately as soon as I got into East Timor. I went there with very little knowledge about that country. I went through over 30 countries on this trip and it was hard to develop a expat level understanding of each place before I went there. So I really went in blind there, and had a determination to see outside of Dili, which is where most people go. There is a lot of expats and foreign NGO type workers in the capital there, but I wanted to see Mount Ramallah, which is the highest peak in the country. Very quickly after letting locals know that that was my intentions, people were quite enthusiastically keen to help me get up there. After being in Dili for a couple of days I met up with these two, this newlywed couple, Antonia and Kiki they were called, and they came around to where I was staying one morning with a pickup truck and their entire family in the back, and basically dedicated a couple of days to touring me around the East Timorese highlands. This is entirely off just a conversation that we briefly had, and it was a good example really in the trip, about how people do want to do this. They instinctively ... they're kind of motivated to help people who they can see need a bit of assistance, and exposing myself and making myself vulnerable to that was really rewarding the whole way through. Speaker 2: There's got to be a level of trust though, isn't there, on your behalf and on behalf of the people who take you on board? The last trip I did for example in Vanuatu which is sort of late last year, before I set off on this trip, I got into a moment where I was terrified, and I didn't trust the people I was around, and it was through my kind of own ignorance. I was basically in this very remote corner of an island and these locals came up to me bearing machetes, and my ignorance really perceived that as a threat, where it was just totally benign, and they were actually coming to offer their own assistance, and after that experience I just realize that you do need to be aware. You can't be naïve to real dangers, but almost every single time someone's coming to engage with you it's through curiosity and through a determination to help you out, and having that knowledge, and having that experience really means every interaction you have is ... you go into it with a pretty optimistic frame of mind. Speaker 2: In the article I read about you, you said Sydney is a gateway to every corner of the globe, and then you go on to talk about the talk about the people that you dined with, including a Mongolian throat singer who we featured in a previous podcast on Mongolia. Tell us about that. Ed Kavanagh: Is that true, you spoke to [Anclaya]? Speaker 2: We spoke to [Booko]. Ed Kavanagh: Okay. So yeah, before I left, and this is a trip that I'd been planning for some time, I was living in Sydney before I left as well, and having done the travel that I'd done before I know how absolutely valuable it is when you meet up with local families and connections from back home, and I was going to some pretty off the beaten path destinations you could say, rural parts of Mongolia, all across central Asia for example. Before I left I spent several months just literally getting onto Facebook and sending messages really at random to people who were members of the Mongolian Community in Sydney or the [Kyrgis] Community in Sydney, and letting them know my plans, and that I'd really love to catch up with them before I left and perhaps get some of their connections all across the world. And these connections that I made through this process which only really happened over a few months, they really served as my beacons across the entire world. I had some really great experiences staying with people in Malaysia, in China, in Mongolia, all across central Asia, Kyrgyzstan, Uzbekistan in particular, and then all through the Balkans as well. I was really lucky to be basically housed by connections I'd only very superficially met back in Sydney, and yeah, it really just validated my kind of knowledge about how intimately connected Australia is to the entire world, and yeah, it just was a really fascinating exploring the planet doing it through those connections you made back home. Speaker 3: Using Facebook what was originally designed for. Awesome. Ed Kavanagh: Exactly, Mark Zuckerberg would probably be pretty happy with that use. Speaker 2: Okay, tell us about Tajikistan and the scene of the indoor volleyball incident. Ed Kavanagh: Yeah so this ... a few chats I've had after I got back, some people have asked what is the sort of thing that stands out? And I think some people want or expect there to be some dangerous, crazy episode that saw me hanging off a cliff or something ridiculous. 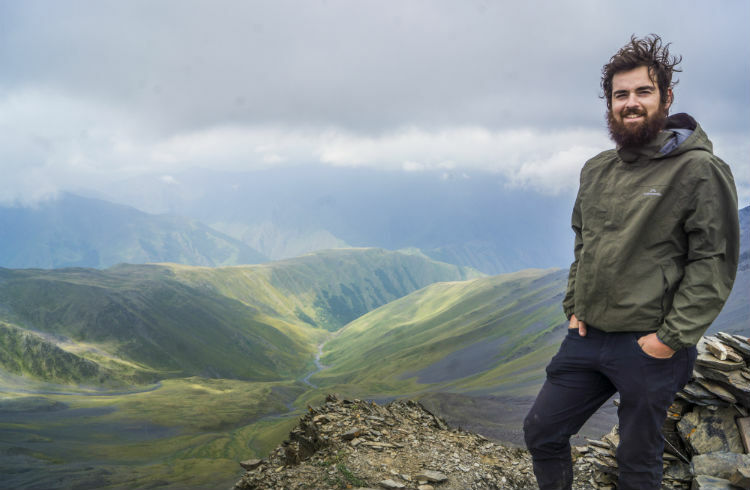 For me there was this one experience that happened in Tajikistan, which reemphasizes how absolutely familiar kind of everyone's experiences of life really can be. I was in this very, very remote village. It's called [Zubervand]. It's a few hundred people that sits right on the border with Afghanistan in the deep south of the [Parmia] area, and I was lucky enough to be housed by a family who had picked me up along the way, and I ended up staying with them for a few days, and they had two young kids who really reminded me of myself and my brother. They were two young brothers about seven or eight and ten or eleven years old. And the older one was just a mad volleyball fanatic, and his dream was to go and play volleyball for Tajikistan, and he was just always running around with his volleyball, and any bit of rubbish, a tennis ball, whatever, volleyballing it over the rafters and all this sort of stuff. Ed Kavanagh: Yeah, and they'd cleaned it up, rehung it, and hoped their dad didn't notice, and we're at dinner later that night, and they were kind of smiling and giggling with each other and kind of saying, "We've got away with it. We've got away with it." And when I was looking at that, it was just really interesting, because I was in basically the most foreign place I've never been in my life, and I was watching this scene from my own childhood being played out in real time. I mean I did the exact same thing playing cricket and football in my living room. Me and my brother had our own coded language, and it was one of those moments where you just realize how absolutely familiar our experiences can be even if we're separated by half a continent and a different language and everything in between. Speaker 3: Yeah, it's lovely. Speaker 2: Now you also met refugees. Ed Kavanagh: I did. That's something I'm really curious and interested in just as an Australian, it's obviously a very controversial and difficult issue in Australia, and it was really interesting to me seeing ... not only in our region there were a lot of refugees. I mean, I did meet some in Indonesia. I had a really good chat with an 18 year old, [Hazaro] refugee who was stuck in Indonesia indefinitely as there are about 15 to 20 thousand other refugees at the moment, and he dreamed of coming to Australia like so many do, and had been really told that he wasn't able to for the next 15 years. So he'll be waiting in Indonesia without legal work or education status for that duration of time, and it really ... putting a human face on it and making friends with these people is really striking. And then in the wake of the Syrian crisis at the moment, all through the Balkans, Turkey, and the Caucuses, you just meet Syrian refugees everywhere. They're extraordinarily educated, highly motivated, really great people, and it's just so unfortunate for them that they really have been absolutely exiled from their homeland, and are really trying to make their way just anywhere in the world that twill have them. So that was a really eyeopening experience. It really pinned this trip to this moment in history as well. It's something I will certainly look back on in years to come, and know that I actually did see kind of face to face the reality of this issue that's gripping the entire world. Speaker 3: So you came across refugee camps? Or you just find people on the move? Or how did that happen? Ed Kavanagh: I didn't go to any camps per se, but there are quasi camps all through the Balkans. I mean we're looking ... as we're recording this there is a lot of news about a migrant caravan in central. There is a similar occurrence going on all through the Balkans. Lots of Syrian refugees go through to Turkey and then continue all the way up to Hungary effectively, where they're ... well they're not so much anymore, but they were at the time, and there are cities and towns in Bosnia and Serbia and elsewhere which do have often hundreds of refugees camped out in parks, just kind of sitting idle waiting a chance to claim asylum somewhere, and it's just incredibly eyeopening thing. As I said you go and speak to these people, and Syrians perhaps even more than some other places, are incredibly educated, smart, engaged, internationally focused and minded people, and it's really eyeopening seeing it first hand. Speaker 2: You just paint this amazing picture of this experience that you had, but then you end up in London. When you get there did you reflect on all those experiences? Those moments like that that really affected you? Ed Kavanagh: It was a weird sort of anti-climactic moment in some ways getting into London. I got there about midnight and went into typically dodgy hostel, like I'd been staying in the entire year, and I remember speaking to some people at the check in and they're saying where did you come from? What did you do? And it was kind of a silly thing to explain to them, well I've just traveled in 150 odd planes across 30 countries and 23000 kilometers to get here. I didn't really go into that. When I got there I was so ready to go home to be honest. I spent a couple of days in London just enjoying just being there, but it wasn't really til I got on the plane, and even now, a few weeks after I've been back, that you can start to really put it in perspective what you've done. When you're doing this trip it's really hard for it to feel like one continuous thing. Often it feels like you're doing a series of small, little trips in between, and you really need to look back on it with a broader lens to get a prospective about it as a whole, and I think I'm still in the process of digesting that. Speaker 2: Well you've documented it on your blog 'One road to London,' surely you're not going to be idle for too long? What's next? Ed Kavanagh: No, look I'm very much enjoying being back home for now. It's summer in Australia, Adelaide is an incredible city to come home to, and I haven't lived here for quite a few years. So I think my family will be a little concerned if I elucidate my future travel plans in too much detail, but I'm certainly keen to see much more of our region. Some of the places I really fell in love with this trip were [Flores] in Indonesia, and East Timor, and I really want to get back there as quick as I can, and I want to see more of the Pacific. I've done a little bit of exploring and journalism work in Vanuatu for example, and I'd love to see more of the Pacific, more of my own region, and really focus on even seeing more of Australia soon. So that's where I'm thinking. Speaker 3: Got rid of the Magna? Ed Kavanagh: I'll have you know I still have not owned a car from this century. I actually pivoted from a 1999 Magna to a 1999 Commodore which I got free [inaudible] the country. So cars aren't my specialty but I'm happy if it gets me from A to B then that's absolutely fine. Speaker 3: That's right. It's a box with four wheels in each corner. It gets you from A to B. I'm with you on that one. Speaker 2: Yeah, Ed, look, great story. Thank you so much for sharing it with us. Ed Kavanagh: Thanks so much for having me. Speaker 5: This information is only a brief summary. Read the full policy, wording very carefully. Visit worldnomads.com, that's all you need to do. It's general advice and it may not be right for you. Read the full policy, it really won't take long. Speaker 3: And catch you next week when we share some of our favorite chats from 2018. Speaker 1: Amazing nomads. Be inspired.